Mark Connolly is the host of Edmonton AM, CBC radio's morning show. He spent 22 years as a sportscaster with CBC radio and Television before taking the job as news anchor at CBC News Edmonton from 2010-2013. Mark grew up in Edmonton, and in his teens actually worked at CBC Edmonton as a janitor. In this job, he gained exposure to the CBC sports department, and discovered what he felt was the perfect career - a job that appeared to involve little work and plenty of time to attend sports events. Perfect! Mark's first full-time job was in radio in Fort McMurray Alberta, where he was the play-by-play voice of the Fort McMurray Oil Barons in the Alberta Junior Hockey League. 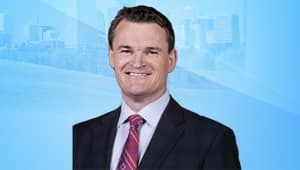 He then worked in radio in both Red Deer and Edmonton before starting a weekend job at CBC Edmonton in December 1988, which has evolved through the years to his position today as Host of Edmonton AM. In his decades with CBC, Mark has covered seven Olympic games including the Beijing Olympics, numerous world championships, and the 2002 Commonwealth Games. Mark and his wife Alyson have two boys, Patrick and Jack.